I need help for a problem occurred during partition resize. I was extending the second partition from 250 GB to 300, but the process suddenly stopped when 20 GB were already moved. After a reboot, I can open the partition (size now is 300 Gb), but some files (audio) won't open (they can be copied and pasted in another directory, but they cannot be opened); some files can be opened, but the player plays pieces of other files. We really need the Saved Details from applying the pending operations to be certain what operations GParted was performing and what the exact sector offsets for the partitions were. Also because GParted rolls back partial moves on failure we need to see exactly what happened and didn't happen in order to provide correct and accurate recovery steps. Make an image backup of the whole hard drive. Outside of GParted, re-create the second partition with it's exact original partition start and end positions. Thanks for your answer. Unfortunately I have no saved details: Gparted was running live. It stopped because of an I/O error, and clicking on Retry, Cancel or Ignore had no effect. After a while, the screen has turned black with a list of numbers updating very fast. The hard drive led was not blinking anymore. I think that the more or less 20 GB it moved can now be read. But when I try to open an audio file that was placed in the remaining 180 GB, the player plays the piece of another audio file (or, with other files, it gives error). Making guesses, you were moving the start of the partition, because that involves moving the data in the partition, as well as resizing the contained file system. Also assuming you weren't moving the end of the partition. Yes, Gparted was moving my files to the new partition start (51200 MB back from the old partition start) when stopped at 20 GB moved. I wasn't moving the end of the partition. Do you mean to resize it again making it 51200 MB smaller from the new partition start? Or deleting this partition, creating a new partition over this one and using the Attempt data rescue? But when I try to open an audio file that was placed in the remaining 180 GB, the player plays the piece of another audio file (or, with other files, it gives error). Don't try to use the file system in it's current state. Mounting the file system (except read-only) may lead to further corruption and loss of data. (I am assuming that the problem hard drive is /dev/sda. Change as needed). This is what your hard drive originally looked like as an ASCII art picture. ("ABC...WXY" represents the file system itself). 1. Setting the start of the partition 50 GB to the left. 2. Copying the file system content 50 GB to the left. (Since the file system was 250 GB that will involve overwriting the later parts of the file system). 3. Growing the file system to fill the now 300 GB partition. Specifically when you are accessing your file system you are only accessing the first 20 GB successfully copied. Beyond that, as far as that copy of the file system is concerned there is just garbage. However at offset 50 GB into the new partition is your original file system. This is why I said above, don't use the file system as it may lead to further corruption. The partition we are talking about is sdb2. We have to work out the exactly location where the original partition use to be. Search for magic signatures of NTFS. 1) NTFS signature of the partially copied file system at the start of the partition. 2) NTFS signature at the start of the original copy of the NTFS file system. The first column on this line is the one we need to use in the calculation below. 3) NTFS signature of the end of the original copy of the NTFS file system. Edit new partition table description file, replace the start and size figures for the /dev/sdb2 line with those computed just above. I notice in your output that sdb1 is mounted on "/media/Fabio WD". Ensure all partitions on hard drive /dev/sdb are unmounted. It should be all OK now. Use GParted and perform a check on partition sdb2. Make a backup of data you care about. GParted has already failed once because of hardware I/O errors. 8 hours ago I started to run this command, but at the moment (it's still running) it has found only the first of the three lines you indicated (exactly the same you wrote). The command is reading all 300 GB of partition sdb2 so will take a while to run. Is it normal that it takes so much time? It's connected directly via SATAII. CPU usage is 100%, and hard disk's led blinks (slowly). I would have expected to read 300 GB from a SATAII hard drive to take less than 1 hour. Feb  4 12:19:48 partedmagic auth.info sshd: Server listening on 0.0.0.0 port 22. Feb  4 12:19:48 partedmagic auth.info sshd: Server listening on :: port 22. Feb  4 11:48:59 partedmagic daemon.crit smartd: System clock time adjusted to the past. Resetting next wakeup time. I'm on a desktop PC, now the drive is /sda. Do you suggest to stop and retry on another PC (but only on USB 3.0)? I stopped the process. I tried this command on a usb flash drive, creating a 100 MB NTFS partition. It completed the task in 80 seconds: less than 2 mb/s. Why is it so slow? I tried on my machine with SATA3 connected drive and got about 3 MB/s and found hexdump using 100% CPU. For 300 GB I estimated it would take my machine 24 hours! It appears that hexdump is very inefficient. Run this to specify an offset from where hexdump should start reading from. Will reduce the amout it has to read to about 6 GB at most. Press [Ctrl-C] when one line is displayed. This will give you the needed original start of the NTFS file system for the calculation. P.s. : here I read /sdb, not /sdb2: is this an offset from disk start or partition start? Sorry about that. Yes it should be an offset from the start of the second partition. Can we trust about this short time? Anyway, considering offset, I think that the first line is the one we need, if you agree. But here a further doubt: should we also expect the magic signature of the old first partition ending (the one I reduced, taking 50 GB for the second one)? Byte offset c7ffffe00 is 104857599 sectors ~= 51199.9995117 MiB. Byte offset c80000000 is 104857600 sectors = 51200 MiB = 50.0 GiB. Also checked and partition 2 starts at sector 3277850624 = 1600513 MiB = 1563 GiB. Since GParted works in multiples of MiB, use the figure c80000000 as the original start of your NTFS in the calculation. N.B. 1 MiB = 1024*1024 bytes; 1 GiB = 1024 MiB. I performed all steps you told me in post #7: the partition size now is 250 GB, I have a 50 GB unallocated partition between partition 1-2, and files are OK! Even Gparted check is ok (it took less than a second). First of all, thank you for your help, you also explained all passages so I've learned new things about disk partitioning. Now, I'm performing a MD5 check on files stored on partition 1 (but I backed them up before the final operation); then I will perform a MD5 check between the current partition 2 files and the files recovered by Photorec. Now, assuming that in the first days after this problem I mounted the partition on Windows to check what happened after the resize error (trying to play some file, but without any write attempt), what do you think about the risk of some file corruption? They are all (long) audio files. If you were me, would you trust more about Photorec results or current datas? I am glad you got your data back. 1. I don't know what Windows does when it accesses a corrupt NTFS file system to try to read files only. 2. I have read the theory of how Photorec works, but never used it in practice. In your situation I would hope corruption hadn't occurred and go with the fixed file system. Especially as you say Photorec hasn't recovered all files. I also recommend checking both the hard drive and file system for corruption. The hard drive because GParted previously failed with an I/O error to give us this mess and the file system because of possible corruption from use while partially copied. 1. Check the hard drive is okay by reading every block from the whole 2 TBs. As a guess this will take 5 hours give or take a factor of 2. 2. Try reading every file on the file system. Again this will likely take a few hours. 4. 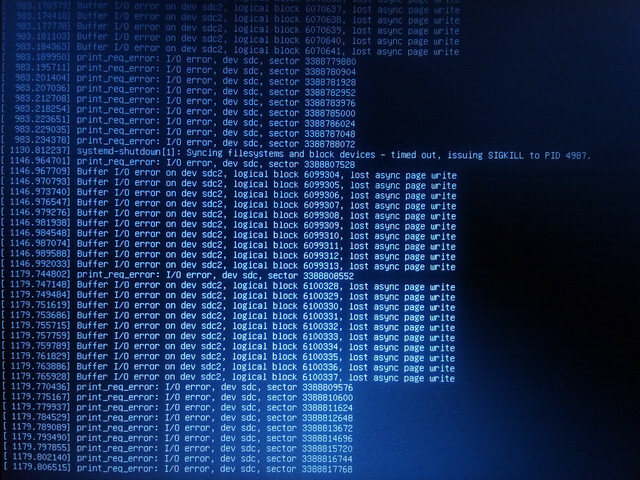 Boot into Windows and run a chkdsk on the NTFS. (How to Check Disk for Errors Using chkdsk and Command Prompt). I also wanted to check disk's health. These are both partitions; Fabio2 is the one we've recovered. Is this the right behavior of this command? Il file system è di tipo NTFS. L'etichetta del volume è Fabio WD. 0 record di file di grandi dimensioni elaborati. 854 voci di indice elaborate. 44 file di dati elaborati. Verifica dei dati del file completata. 1638924287 KB di spazio totale su disco. 982654000 KB in 323 file. 188 KB in 45 indici. 117755 KB in uso dal sistema. 656152344 KB disponibili su disco. 4096 byte in ogni unità di allocazione. 409731071 unità totali di allocazione su disco. 164038086 unità di allocazione disponibili su disco. L'etichetta del volume è Fabio2. 2476 voci di indice elaborate. 87 file di dati elaborati. 262158335 KB di spazio totale su disco. 210690960 KB in 1954 file. 636 KB in 88 indici. 77791 KB in uso dal sistema. 51388948 KB disponibili su disco. 65539583 unità totali di allocazione su disco. 12847237 unità di allocazione disponibili su disco. Sorry for the language. Both partitions reported no problems found and no need of furher actions ("Analisi del file system effettuata. Nessun problema rilevato. Non sono necessarie ulteriori azioni."). If you think that all is okay, I will move current files from partition 2 and 1; delete partitions; create new partitions; and move the files back on this disk. After a forced reboot, Ubuntu S.M.A.R.T. utility (in Disks) reported "disk ok, 1 bad sector". In the details, the bad sector counter was 0, but there was a problem with Write error rate. The strange thing is that the upper write error rate is 0; on Crystaldisk info and HDTune Pro I have only one write error rate attribute, which value is 0. Rebooting again, no problems: Gparted refreshes the list, I can mount partitions and even the S.M.A.R.T. is OK. What do you think about this? Can it be just a logical error (maybe caused by the first Gparted error, or today by chkdsk)? I'm now performing another surface disk test with HDtune pro. Like ddrescue, HDTune reported all blocks working (green). So occasionally the drive is experiencing both read (GParted got stuck refreshing devices) and write errors (reported in /var/log/messages). 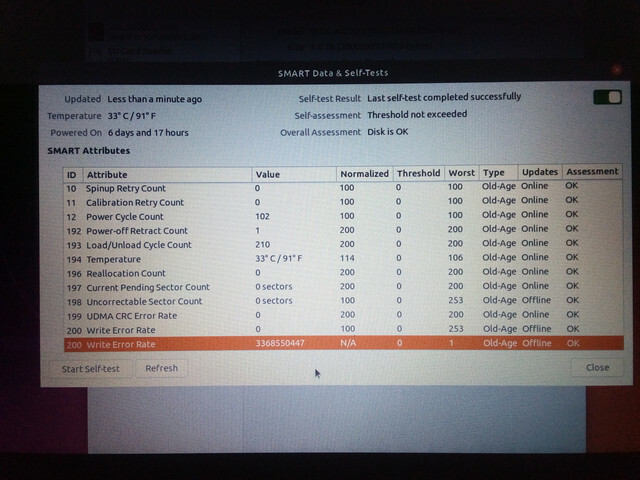 Given that the SMART information mostly looks OK, my first guess would be connector not seated correctly or faulty SATA cable. 1. Reseating the SATA cable, both ends. 2. Replacing the SATA cable. And see how it goes after each. If the error persists run the command line query all of SMART information from the drive. The disk usually works in a USB enclosure, but the first Gparted error and this actual problem occurred on different boxes. Again, it doesn't mount the partitions. And, opening Gparted, it doesnt't complete the Scanning all devices operation. It took a while to safely shutdown the disk. I connected it again and it mounted partition 2, but got stuck on mounting partition 1. It seems to be a mounting problem: Ubuntu tries to mount this USB disk when I plug it in, the process get stuck and even Gparted doesn't end the scanning operation. recommended polling time:      ( 257) minutes. It's a strange behavior, but it seems related to a specific USB box (on Ubuntu; no problems on Windows); anyway, I performed with this box the ddrescue test you suggested and it worked fine. Regarding the disk, the bad sectors count is 0, but I need to know if it is reliable: maybe a (long) format can be useful to check those sectors? Yes that hard drive is perfectly good. It is connectivity issues via USB that is causing issues. From the smartctl output, overall health is good. No errors logged by the drive. An update just to confirm your guesses. I formatted the whole drive (slow format), partitioned and put all data back on it. After these write operations, S.M.A.R.T. is OK and the surface scan was able to read all blocks. Thank you mfleetwo! You gave me a great help.